Leading off our End of Work Reading List this week is a series of explorations of gender and sexism in the creation of artificial intelligence and automation technologies. Why are so many robots and virtual assistants designed with female forms and voices? Will women suffer more economic dislocation from the coming wave of automation than men? We will also look at the latest McKinsey Global Institute report on AI and automation’s impact on human work, and summarize stories on other topics: the writers working for Microsoft to improve Cortana’s dialogue; an effort to automate decision-making at one of the world’s largest hedge funds; and a deep dive into the past, present, and future of manufacturing—a sector that’s often oversimplified and misunderstood in policy debates. Hayasaki delves into the best predictions of job losses to automation and AI—from Oxford University, the World Economic Forum, and McKinsey—and finds that the economic dislocation will be hardest on women, with fields where they are disproportionately represented being among the first to see big impacts. Viewed through this lens, efforts to attract and retain more women in STEM fields—to make sure that they are equal partners in inventing the future—seem more important than ever. —Meanwhile, in Davos, New York Times columnist Nicholas Kristof interviews Sophia, a humanoid robot torso and head at the World Economic Forum. Sophia talks about her emotional range, but notes that her default is happy. Kristof, in a tweet, notes that “creepily, geeks made her a hot, humanoid robot.” Kristof asks Hanson Robotics’ founder and Sophia creator David Hanson about the issue of gender and other aspects of humanoid robots that creep him out. —The McKinsey Global Institute is out this month with an update of its ongoing research into the impact of artificial intelligence, automation, and robotics on jobs from the bottom of the global economy to the top. Chui says the proper way to frame your view of automation is to look at individual activities that jobs are comprised of, not individual jobs themselves. After looking at “every single activity that we pay people to do in the economy,” the MGI study finds that “less than 5 percent of jobs can have all of their activities automated by adapting currently demonstrated technologies,” he says. Those current technologies could automate about 30 percent of the activities required by 60 percent of occupations—including activities that take up a quarter to a third of a CEO’s time. “Almost every job has a significant percentage of its activities that can be automated,” Chui says. In the U.S. some 60 million jobs, representing some $2.7 trillion in wages, include labor that can be automated using current technology. The activities with the highest potential to be automated: predictable physical activities; data processing; and data collecting. The difficult activities to automate? Managing people; complex, empathetic interactions; human creativity. There’s much more to unpack in this report; we’ll continue referring to it as our coverage of the End of Work expands. —The world’s top-performing hedge fund, Bridgewater hired the man who led development of IBM Watson to create an automated system to assist or perhaps someday replace the human managers at the firm. The Wall Street Journal delved into this work, quoting one employee who described it as “trying to make [Bridgewater founder and CEO Ray Dalio’s] brain into a computer,” and others who describe working at the firm as participating in “experimental research into human decision-making”. The piece documents the data on which the system is being built: Bridgewater’s codified principles, and a host of detailed employee data, much of it gathered via custom apps, including peer reviews, snap polls, psychological tests, and answers to daily multiple-choice quizzes on management problems. The Bridgewater system would aid in things like hiring decisions and mediating internal disagreements. WSJ reporters Rob Copeland and Bradley Hope write: “The ultimate vision is that PriOS would be able to predict outcomes of meetings before they are completed, and to guide people to take certain actions throughout the day. Within five years, Mr. Dalio aims for nearly three-quarters of management decisions to be determined by PriOS. 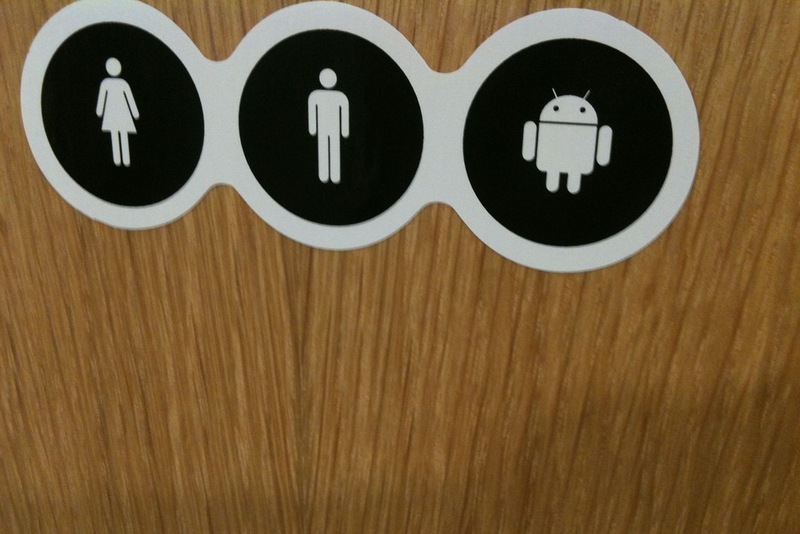 Photo of a bathroom door at a Google office in Brussels by Paul Keller via Flickr, cropped and used under a Creative Commons License.